Whether you file a Chapter 7 or a Chapter 13 bankruptcy, you’ll have your bankruptcy hearing (also called a First Meeting of Creditors or 341 Hearing) in this building. 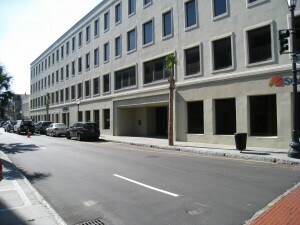 It’s the Sun Trust building on the corner of King and Queen Streets in Charleston. South Carolina is a bankruptcy district, and the District of South Carolina has three divisions: Greenville/Spartanburg, Columbia, and Charleston. What Counties are Part of the Charleston Division? If you live in places close to Charleston like Mt. Pleasant, Goose Creek, or Summerville, you probably wouldn’t be surprised to know that your bankruptcy hearing will be held in Charleston. However, the Charleston division covers a huge geographical area running along the eastern side of the state from North Carolina all the way down to the Gerogia. Specifically, the following twelve counties are part of the Charleston division: Allendale, Beaufort, Berkeley, Charleston, Clarendon, Colleton, Dorchester, Georgetown, Hampton, Horry, Jasper, and Williamsburg. This means that even if you live as far away as Beaufort or Myrtle Beach, your hearing will be in Charleston. While driving in Charleston can sometimes be a hassle, it’s easy to find the bankruptcy court. Take I-26 to Meeting Street. From there, head south toward downtown Charleston. You’ll go almost all the way down to Broad Street, so you’ll be on Meeting Street for quite a ways. Take a right onto Queen Street (the Mills House is right on the corner). Once you turn right, go a short distance further. On your left, you’ll see a parking garage. You can park in that garage, or you can continue past King Street where you’ll see another parking garage on your left. The second parking garage is newer, and I’d recommend it if you drive a large vehicle like an SUV or full-size truck. The first parking garage is in front of the Sun Trust building where you’ll go for court, and the second garage is behind it. Parking usually costs about $3-4, depending on how long you park. The Sun Trust building is on King Street right across the street from the first parking garage you’ll come to. Court is held on the second floor. Take the elevator in the lobby to the second floor. When you get off, just head down the hall to your left and go into the courtroom. There is no sign in sheet, so just go into the court room and wait for your attorney. You’ll be given a specific time for your hearing. Hearings are scheduled on the half hour with several scheduled during any given half-hour period. You should arrive early for your hearing. Watching other hearings prior to yours will give you an idea of the exact questions your bankruptcy trustee will ask. If you don’t know the answers to any of the questions, you’ll be able to ask your attorney prior to your hearing. This sort of information is really useful for clients. It’s a good idea to make it available like this. I actually didn’t know where the bankruptcy court was in Charleston. Now that I know where the bankruptcy court is, I’ll have to stop by to take a look next time I’m visiting.